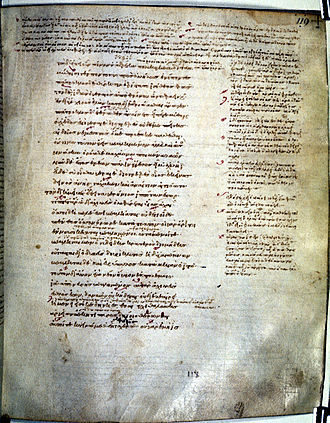 In the Iliad, Mentes (Μέντης) is the King of the Cicones. In Book XVII of The Iliad, Apollo disguises himself as Mentes to encourage Hector to fight Menelaus, ("Hector, now you're going after something you'll not catch, chasing the horses of warrior Achilles, descendant of Aeacus. No mortal man, except Achilles, can control or drive them, for an immortal mother gave him birth. Meanwhile, warrior Menelaus, Atreus' son, standing by Patroclus, has just killed the best man of the Trojans, Euphorbus, son of Panthous, ending his brave fight.") This is the only reference to the king in the text. 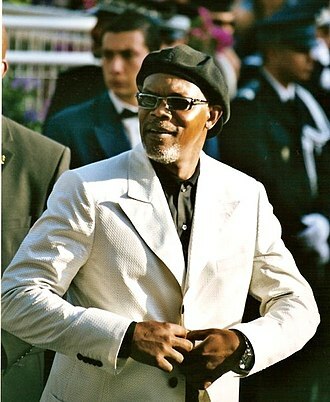 He is not the same character as the Mentes in the Odyssey, who is king of the Taphians. In Greek mythology, son of Thestor, was an Argive seer, with a gift for interpreting the flight of birds that he received of Apollo, as an augur, Calchas had no rival in the camp. 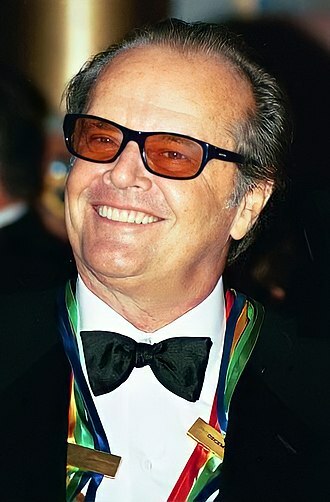 He interpreted the entrails of the enemy during the tide of battle, the episode was related at length in the lost Cypria, of the Epic Cycle. He states that Troy will be sacked on the year of the war. 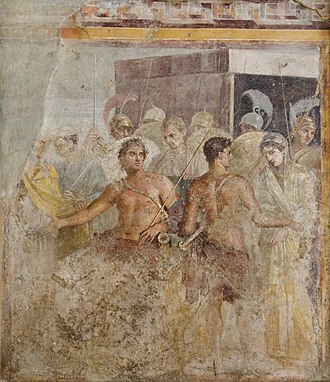 In Sophocles Ajax, Calchas delivers a prophecy to Teucer suggesting that the protagonist will die if he leaves his tent before the day is out, Calchas plays a role in Quintus of Smyrnas Posthomerica. Calchas said that if they were brief, they could convince Achilles to fight and it is he rather than Helenus that predicts that Troy will only fall once the Argives are able to recruit Philoctetes. 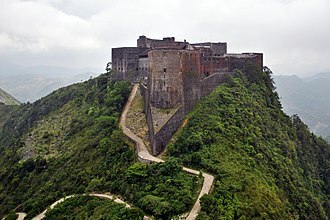 It is by his advice that they halt the battle, even though Neoptolemus is slaughtering the Trojans and he tells the Argives that the city is more easily taken by strategy than by force. He endorses Odysseus suggestion that the Trojan Horse will effectively infiltrate the Trojans and he foresees that Aeneas will survive the battle and found the city, and tells the Argives that they will not kill him. 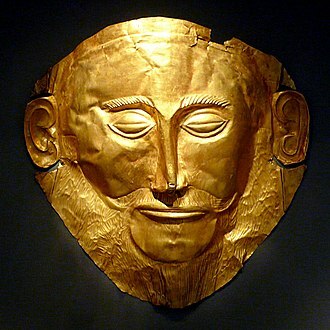 This article is about Teucer, son of King Telamon of Salamis in Greek mythology. For Teucer, son of Scamander and Idaea in Greek mythology, in Greek mythology, Teucrus, Teucros or Teucris, was the son of King Telamon of Salamis Island and Hesione, daughter of King Laomedon of Troy. 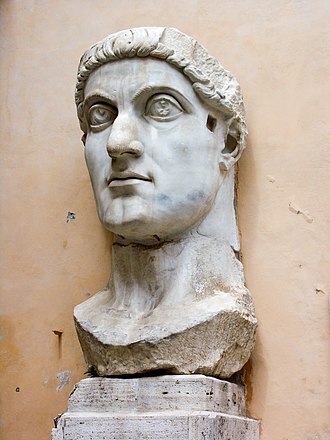 He fought alongside his half-brother, Ajax, in the Trojan War and is the founder of the city of Salamis on Cyprus. 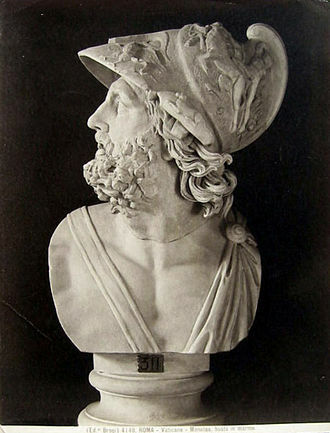 Through his mother, Teucer was the nephew of King Priam of Troy, during the Trojan War, Teucer was mainly a great archer, who loosed his shafts from behind the giant shield of his half-brother Ajax the Great. 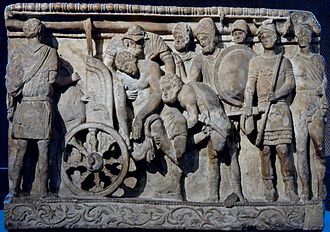 When Hector was driving the Achaeans back toward their ships, Teucer gave the Argives some success by killing many of the charging Trojans, including Hectors charioteer, Archeptolemus son of Iphitos. However, every time he shot an arrow at Hector, Apollo, at one point in his rage at Teucers success, Hector picked up a huge rock and flung it at him. The rock injured Teucer, so that he retired from the fighting for a period of time. He took up a spear to fight in the war after his bow was broken by Zeus and he once again challenged Hector, and narrowly avoided the path of Hectors flying javelin in the ensuing battle. He was one of the Danaans to enter the Trojan Horse and he wounded Glaucus, son of Hippolochus. 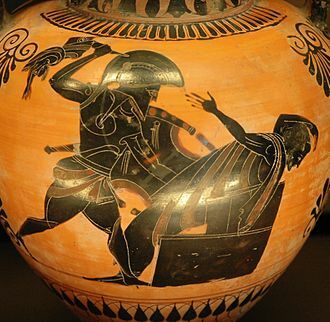 After Ajaxs suicide, Teucer guarded the body to make sure it was buried, insulting Menelaus, finally Odysseus persuaded Agamemnon to let the burial happen. Because of his half-brothers suicide, Teucer stood trial before his father and he was disowned by his father, wasnt allowed back on Salamis Island, and set out to find a new home. 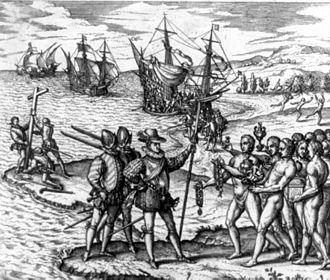 This speech has been given a wider applicability in relation to the theme of voyages of discovery, Teucer eventually joined King Belus II in his campaign against Cyprus, and when the island was seized, Belus handed it over to him in reward for his assistance. 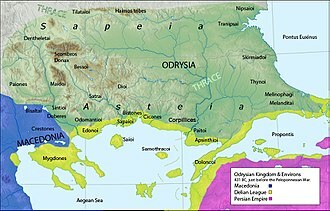 Teucer founded the city of Salamis on Cyprus, which he named after his home state and he further married Eune, daughter of Cyprus or Cinyras, and had by her a daughter Asteria. In Greek mythology, Antilochus /ænˈtɪləkəs/ was the son of Nestor, king of Pylos, and was one of the Acheans in the Trojan War. One of the suitors of Helen of Troy, he accompanied his father and he was distinguished for his beauty, swiftness of foot, and skill as a charioteer. Though the youngest among the Greek princes, he commanded the Pylians in the war and he was a favorite of the gods and a friend of Achilles, to whom he was commissioned to announce the death of Patroclus. When his father Nestor was attacked by Memnon, Antilochus sacrificed himself to save him, thus fulfilling an oracle which had warned to beware of an Ethiopian. Antilochus death was avenged by Achilles, in the Odyssey, the three friends are represented as united in the underworld and walking together in the Asphodel Meadows. According to Pausanias, they together on the island of Leuke. Among the Trojans he killed were Melanippus, Atymnius, Phalces, at the funeral games of Patroclus, Antilochus finished second in the chariot race and third in the foot race. 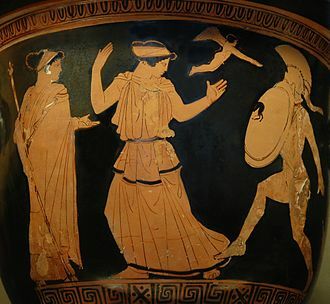 Achilles mother Thetis foretold many years before Achilles birth that there would be a great war. She saw that her son was to die if he fought in the war. 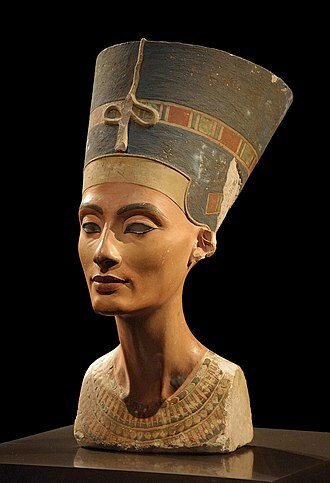 She sought a place for him to avoid fighting in the Trojan War, disguising him as a woman in the court of Lycomedes, during that time, he had an affair with the princess, who gave birth to Neoptolemos. 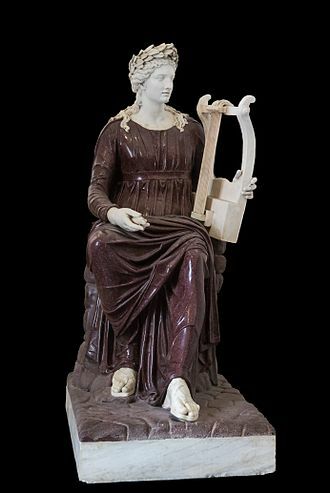 Neoptolemos was originally called Pyrrhos, because his father had taken Pyrrha, the Greeks captured the Trojan seer and forced him to tell them under what conditions could they take Troy. 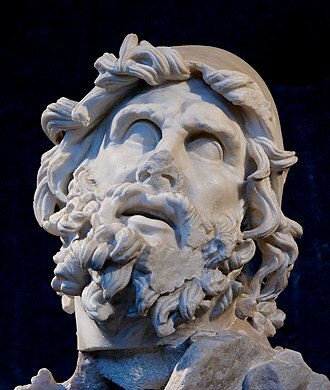 Helenos revealed to them that they could defeat Troy if they could acquire the poisonous arrows of Heracles, steal the Palladium, in response to the prophecy, the Greeks took steps to retrieve the arrows of Heracles and bring Neoptolemos to Troy. 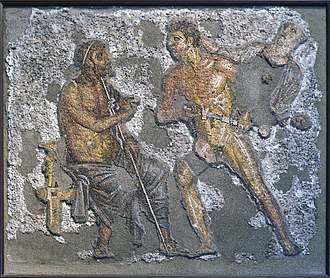 Odysseus was sent to retrieve Neoptolemos, a mere teenager, the two went to Lemnos to retrieve Philoctetes. 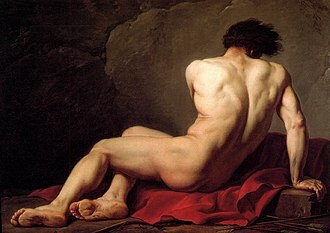 Years earlier, on the way to Troy, Philoctetes was bitten by a snake on Chryse Island, agamemnon had advised that he be left behind because the wound was festering and smelled bad. 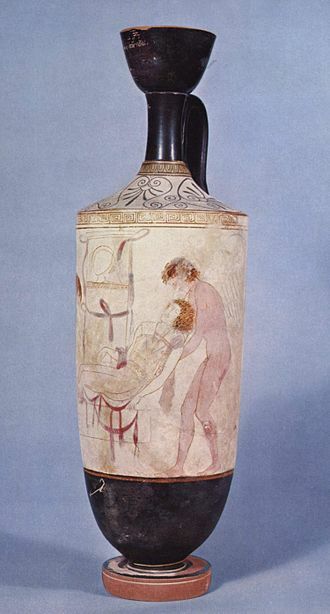 This retrieval is the plot of Philoctetes, a play by Sophocles, euripides, in his play Hekabe, has a moving scene which shows Neoptolemos as a compassionate young man who kills Polyxena, Hekabes daughter with ambivalent feelings and in the least painful way. 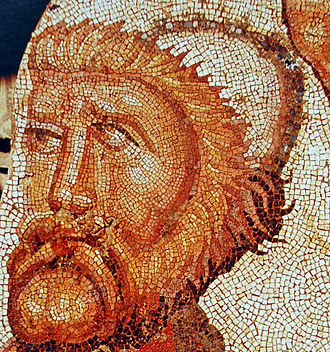 Neoptolemos was held by some to be brutal and he killed six men on the field of battle. During and after the war, he killed Priam, Polyxena and Astyanax among others, captured Helenos, the ghost of Achilles appeared to the survivors of the war, demanding Polyxena, the Trojan princess, be sacrificed before anybody could leave. 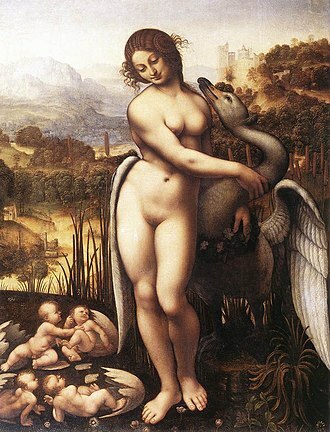 With Andromache and Phoenix, Neoptolemos sailed to the Epirot Islands, with the enslaved Andromache, Neoptolemos was the father of Molossos and through him, according to the myth, an ancestor of Olympias, the mother of Alexander the Great. 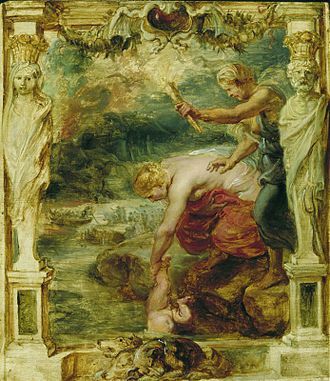 According to Hyginus, his son with Andromache was Amphialos, CXXIII, NEOPTOLEMUS Neoptolemus, son of Achilles and Deidamia, begat Amphialus by captive Andromache, daughter of Ēëtion. 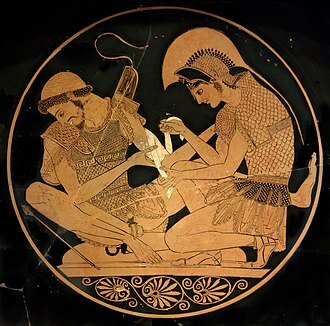 A cup depicting Achilles bandaging Patroclus' arm, by the Sosias Painter. 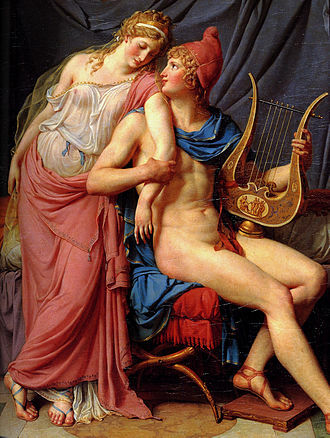 Neoptolemus and Andromache, by Pierre-Narcisse Guérin.